If you are looking a smooth, good tasting, healthy tea with a kick, yerba mate fills the bill. Indeed, it tastes so smooth and mild that its easy to overindulge. 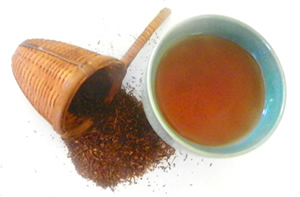 Mixing yerba mate with red rooibos, produces a sweet, lighter mix that is higher in antioxidants with half the caffeine. Adjust the mix to suit your own caffeine tolerance and taste. Recipe Instructions: Herbal Tea :1 teaspoon of herbal blend to each cup hot water. Heat water to just under boiling and infuse for 10 minutes. Drink in the morning, and sip iced in the afternoon for a quick pick me up. Great tea for dieters.